Regular Rate $1797 . Today Only $499! 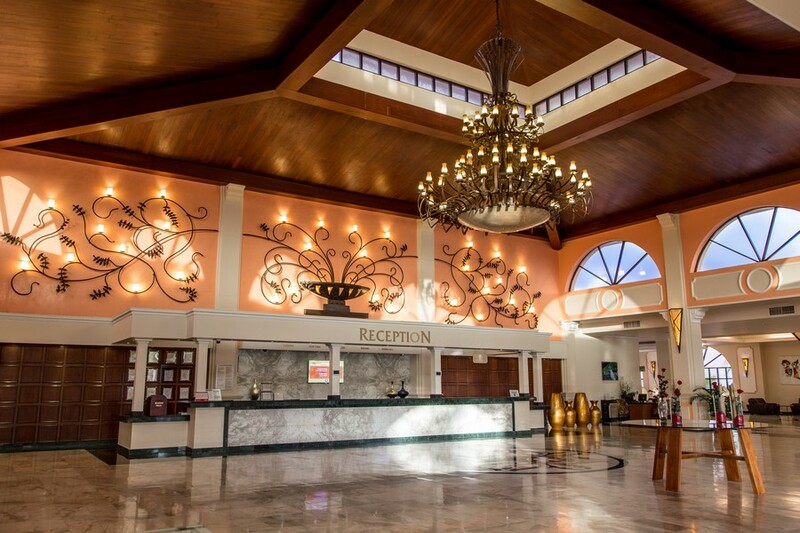 The Sandos Playacar Resort characterizes by the high quality of its facilities and their superb location. Surrounded by the natural wonders of the Caribbean, a point of contact for spirit and space. Located on one of the top beaches in the entire Cancun area, in front of an ample white sand beach bathed by waters blue turquoise of the Mexican Caribbean, this exclusive 5 star, All Inclusive resort offers you vacations of a class that you are accustomed: the best details, best gastronomy Mexican and international in its four restaurants, lodging of luxury in its 460 rooms and Junior Suites and an ample program of activities for all ages and pleasures. We had a terrific time at Sandos, Playacar in November. Great beaches, nice people, excellent facilities! The food was surprising good at their French, Italian, Brazilian, Mexican and Asian restaurants. The mixed drinks were equally exceptional at all locations including the beach. Also, there were plenty of great activities: bicycle tours of local Mayan ruins, water volleyball with mixed drinks at the swim-up bar, tennis, Hobie sailing, snorkeling down by the reef, and kayaking thru the waves. The entire resort staff was exceptional. 3 Daily meals to include every day (Buffet Breakfast, Buffet Lunch, Buffet or a la Carte Dinner). Snacks 24 hours. In rooms, Mini Bar with mineral water, soft drinks and beer (restocked every other day). Safety box. Tennis (unlimited day and night use within schedule of operation, on a first come first served basis). Includes equipment (balls & rackets), proper attire and court shoes required. Water sports: Pedal boats, Boogie board, Windsurfing, Sailing & Kayaking (may be canceled depending on ocean conditions - lessons not included). Snorkeling gear and Scuba Diving lessons in pool. Gym: free use of exercise equipment, sauna, steam room & whirlpool. Daily activities program: Guided walking tours, archery, darts, boccia, table tennis, language lessons, dancing courses, billiards, football, basketball, Aerobics, Beach Activities. Pool games and Water aerobics. Water polo. Beach Volleyball and Water Volleyball. "Kids Club" from 09:30 to 13:00 & 15:00 to 17:00 (Children 4-8/9-12 years) with supervised full activities program: Children"s pool and playground, games and crafts. Mini Disco. Nightly entertainment: Cabaret Shows, Music Halls and Theme Nights. No cover charge at disco. Sports and entertainment team. 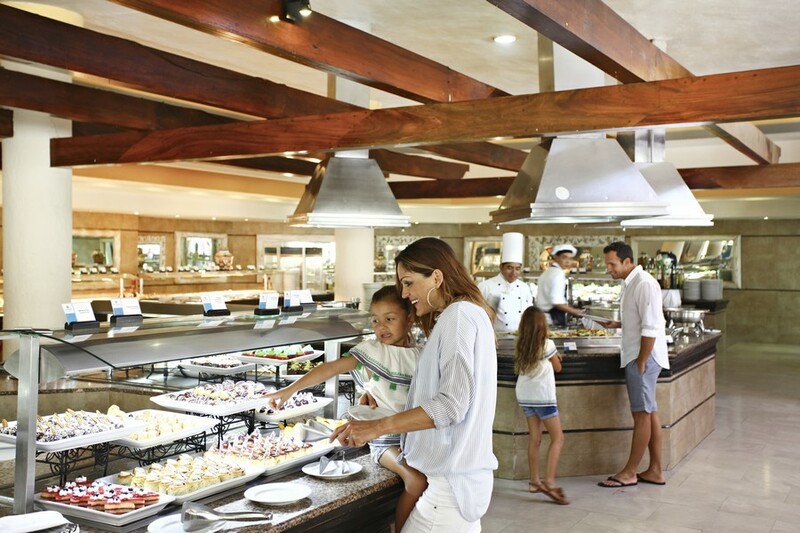 Indulge in the mouth-watering cuisine at our 7 a la carte restaurants and 3 buffet restaurants. Exotic little umbrella drinks? Yeah, we got 'em. 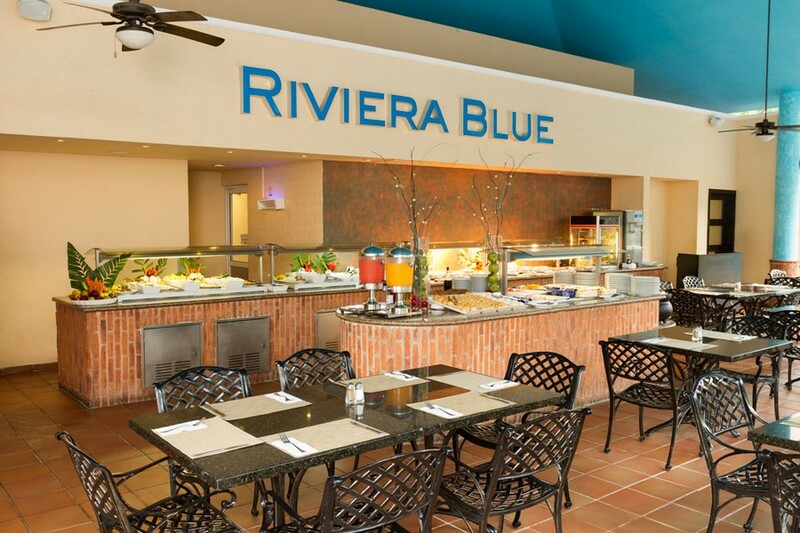 Offers breakfast and lunch items and, by night, it's transformed into a Mexican buffet restaurant, with absolutely delectable Mexican favorites. Open for all three meals daily under a huge, open-air palapa in the Beach section. Offerings at breakfast include Mexican specialties, French toast and pancakes, an omelet station, cereal, sausage, bacon, fresh fruit, yogurt and more. Lunch features a pasta station, sauteed chicken and beef, salads, vegetables, fish and other entrees, plus a dessert spread. Dinner varies nightly, with different themes, such as Mexican, International, Mediterranean, and French. Buffet offering pizza, pasta and other Italian dishes. Sophisticated a la carte french cuisine. Casual a la carte cuisine. A la carte Mexican cuisine. Snack bar offering delicious crepes. Snack bar offering hot dogs, hamburgers, fries, popcorn and self-serve, soft-serve ice cream, among others. Adults-only casual snack bar and buffet, offering sandwiches, hotdogs, burgers, and pizza, among others, for lunch. Dinner options include seafood, salads and soups, in a candle-light and romantic setting. Hi everyone, here I am at Sandos Playacar in Playa del Carmen, Mexico. I've been loving my five nights. The it's been amazing. The staff is super nice. Thanks BookVIP.com for making this happen. We've just had an awesome five days at the Sandos. We booked this vacation through BookVIP. It has been spectacular. We've loved every minute of it. We can't thank BookVIP enough for this vacation. If you want a great place to stay, we can't recommend Sandos Playacar enough! This has been an awesome vacation. The food is great. There are activities every day. The drinks are awesome. I can't say enough about this place! Another beautiful day at the Sandos Playacar. Thank you BookVIP for making it all affordable! It doesn't get much better than this. Beautiful water, beautiful scenery, excellent food, wonderful vacation. It doesn't get much better than this! We have just returned from a truly fab holiday, everything about the resort was amazing, the staff were so warm and friendly......nothing was to much, the wedding venue by the sea was breathtaking and a great time was had by all and as for the food.....well the diet starts tomorrow :-) thank you so much and we will most definitely be back. This was a great hotel right on the beach. It amazed me how big the resort was. We stayed in the adult section all the way at the back of the complex and it was a bit of a walk to the beach but the walk was a nice one. They offer a trolley service but we never once used it. The landscaping of the hotel was great. It was very lush and tons of wildlife on site. We've been to Cancun before so we were looking for something more serene and set back. This resort was perfect. It was the last hotel on the strip and right next to it was uninhabited jungle. We loved the adult section, it was great! The beach was nice and spread out as well. The food was delicious at the a la carte restaurants but the buffets were just mediocre. The rooms were great! They were cleaned every day and very comfortable. They had a lot of great entertainment as well. Make sure you check out the excursion/tour desk in the meeting place. They were very helpful at helping us plan our excursions. The Mayan Riviera is rich with so much history and adventure. I highly suggest you take advantage of that while visiting! All in all we had a great stay and loved it! "Fabulous New Year's vacation with my girls!" My daughters and I went to Sandos Playacar from December 27- January 3 and had a wonderful time! We stayed in the Adults Only Select Club and were treated like royalty when we checked in with Vicky. The gold band gave us the option to swim in the adults only pool and beach area while enjoying the rest of the resort as well. Truly, the most beautiful beach I have ever seen and I loved the clear water for swimming. The entertainment staff were loads of fun and we enjoyed Ellihut, Rodrigo and the others- loads of activities and fun all day long. The new year's eve party was fabulous and was outside in the plaza area creating a very festive environment. There was a show every night that we loved and the Mariachi band night was hilarious. There was a cat caf where a few cats are cared for and were so adorable. The resort has a great environmental attitude and the nearby jungle and wildlife made the holiday even more enjoyable. Thanks to Juan and staff for a great time!! "Great Place!!! Two Thumbs Up!!!" My family and I stayed at Sandos Playacar over the Christmas holidays. 8 people in total. This place is just excellent. Great Pools, Great Beach, Great Suites in the Adult Section, Excellent Food, and Great Staff. I have nothing bad to say about this resort. This place is one of the best resorts we have stayed at in over 20 years of vacationing at All Inclusive Resorts. They obviously have excellent management who knows how to satisfy the needs of their guests. We are seriously thinking about going back next year, which is a first for our family. We were a party of 20 staying here for my daughter's wedding. We were all delighted with the hotel which exceeded our expectations. The choice of eateries was great. We had expected that over a 2week holiday, we would want to get 'a change of scenery' and go into Playa del Carmen, but we never felt the need to. Our choices were buffet, Italian, Mediterranean, French, Mexican, Asian, Argentinian along with beach take away and the fantastic Cup Cake Cafe. Would love to go back - with the same party of 20 of course!! The resort, beach, and staff were wonderful. Daniella and our reception crew went above and beyond to make sure our dinner reservations were confirmed and all of our needs were met. We were at the resort during Christmas break and the resort went above and beyond to make it a special occasion. Christmas dinner was fantastic, the resort was decorated, the staff was looking their best, and the entertainment was lively and fun. This was our first time at this resort and we would highly recommend it to families with any age children. My husband and I stayed here with our three children ages 4, 6 and 8 for six nights right after Christmas and into New Years. The first thing I would like to mention is the cleanliness of the place. Someone is always cleaning, sweeping, tidying up. I didn't see one piece of garbage the entire time I was there. They even put the sandos sun symbol in the ash tray everyday! Everything seemed new and up to date to me. We had a junior suite and it wAs spacious enough for the five of us. The New Years celebration was excellent, as well as the nightly entertainment. A lot of times at resorts it is difficult to find a chair at the beach but that was not the case here. We have stayed at resorts at st. Lucia, Bahamas, st. Thomas and Aruba, as well as hit islands on cruises. Nothing compares to blue of this water. It was gorgeous and warm the end of December. The food was very good. We went to two restaurants and was impressed by the ambiance and quality of the New Years dinner especially. The buffets for breakfast, lunch and dinner were great as well. There was something different for dinner each evening and they open the doors with a champagne flute of something and clapping As you walk in. They have food for all different cultures. We spent christmas at the adults only section of this resort which is wonderful. The rooms are clean and spacious everywhere is kept clean, the staff are happy and friendly especially Kristell Zenteno who brought us many drinks while sunbathing by the pool. The food was great and we really enjoyed the mexican rock band that performed on christmas eve.The french restaurant food is excellent. Highly reommended. We spent our Christmas vacation at this resort. Daniela Delgado was a terrific representative for the resort. She helped us in numerous ways, was courteous, professional and friendly and made us feel welcome right from the start. She is to be heartily commended! Also the entertainment staff was great especially Elliothut. We hope to return next year. "best vacation ever alot of fun"
the resort is beautiful . the staff are always out to help you always smiles on their faces. when i arrived vicky said ill take you to your room if you dont like well change . was so nice just on arrival anything we asked at the hotel within 5 minutes at our room . if you dont have kids travelling with you stay in the select adults only the rooms are big and gorgeous and very quiet . dont hear anything .very relaxing .as far as food everything was delicious . the best is rack of lamb at the gourmet .as far as activities shows entertainment were excellent . very clean property its a fun atmosphere.now the animation team pedro.armondo,philllip,edwardo,jerry,venessa,rodrigoyou guys are all hard workers and make sure everyone is having a good time.the animals monkeysgot to feed them ,donkeys , 4 cute cats ,1 dog and other s was such a good time .very organized hotel.you must go its a good choice . We have just returned from 10 days at Sandos Playacar and have to say that we have never been so impressed with the level of service. We have vacationed extensively in the Mayan Riviera so have many resorts to compare to. Sandos went the extra mile to ensure every detail of our vacation went as planned. Daniela in wedding planning was fabulous insuring our family reunion dinner for 17 was amazing. We emailed her before our arrival and she planned everything for us. Beautiful beach, great management team (do they ever go home?) enthusiastic entertainment team, great food and bars. What more can you ask for? We will return!!! We spent our Christmas vacation at this resort (wife & I and kids 13 & 16). We have traveled to the area many times before and this trip, by far, was the best!! Nothing whatsoever to complain about. The food was great with alot of variety to appease even the pickiest eater. 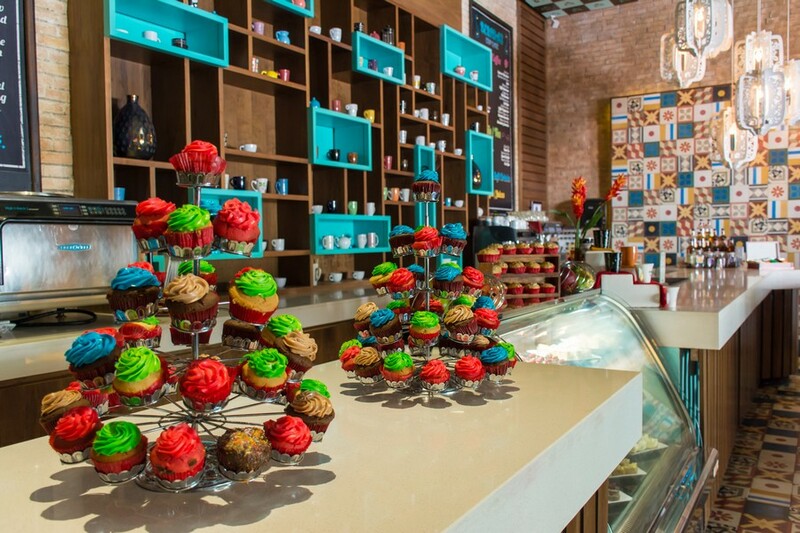 Be sure to visit the cupcake cafe!!! Our 2 rooms in the family section were clean & functional. The activities team (Rodrigo) kept us all entertained with numerous events and jokes daily. The service we received was exceptional!!!! A big thank you to Daniela Delgado for helping us with our dinner reservations and all of the information that we received in the weeks prior to our trip. Juan Guzman, at La Bamba sports bar, was the best!!! Every employee we encountered (waitstaff, housekeeping, maintenance, etc) were very friendly, funny, helpful and eager to go the extra mile to make you feel at home. I am certain that it is this "positive attitude" that makes Sandos Playacar rise above other properties. A "must visit" resort that I will definately plan a return trip!!! Thank you all. We went to Sandos Playacar on a day pass to visit the property while we were staying at the sister Sandos Caracol. From the moment we arrived we were impressed. Reception staff were efficient and pleasant. This is a resort that is great for adults who can take advantage of the adults only section for booking but also very much so for families. There is mini-golf, pool side games and tables and the major hit with my children, the new Teen Club. 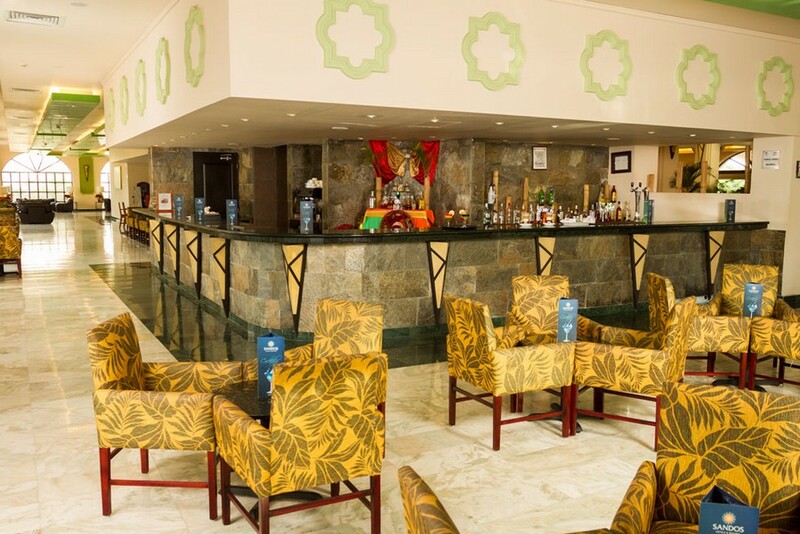 The teen club (geared to kids 13-17 but did have younger and older guests using the facilities) is a chic night-club atmosphere with arcade games, video consoles, gaming tables, dance floor and bar/beverage service without alcohol. It opened at noon and although I hear from many people they don't want their kids on a beach vacation to play video games, there is certainly a time and place to take advantage of this gem of an amenity. Better yet? It is located right next to the cupcake cafe! 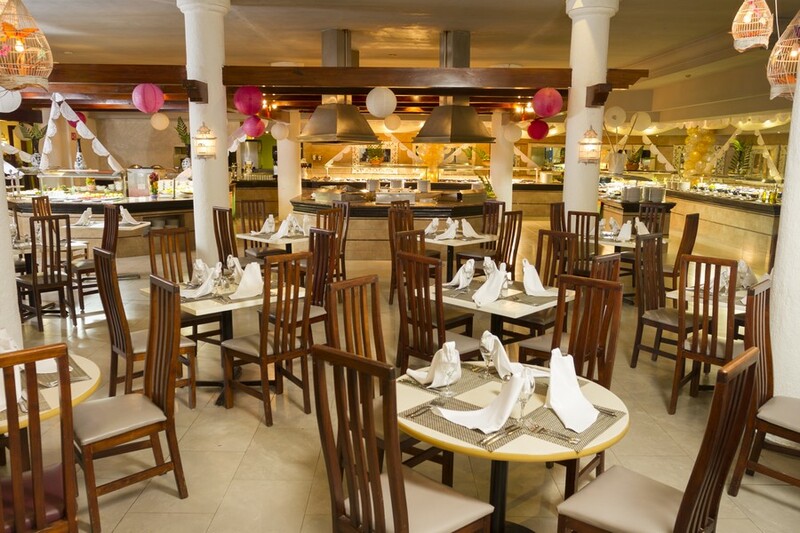 We found the dining and food options very good at Playacar. We enjoyed the beachside smoothie bar where we all got a healthy milkshake. My husband and I also loved we could eat our lunch with our toes in the sand overlooking the ocean at the Bagel Cafe. The beach at Sandos Playacar, given it is the last hotel on the Playacar strip, is gorgeous. Soft sand entry and goes on for what seems like forever. We certainly got tired of walking long before we could see the end of the beach. For the great amenities and beach I love this hotel! We plan to return in the near future, this time splitting our stay between Sandos Playacar and their sister resort Caracol. "Awesome vacation for whole family"
We spent Christmas week at Sandos with a group of 12 --ages 1 yr to 50, It was wonderful from the moment we arrived.. They treated us like royalty. Daniela Delgado went out of her way to help with restaurant reservations for 12, both before we arrived and once there. Work with her if ;you get the chance. There was so much to do at the resort we were never bored. The teens loved the crepe bar and we all enjoyed the cupcake cafe each day as a nice break from the beach. We borrowed the bikes on site and rode down to 5th avenue-a must do if you are there. You can also take a cab for $7 each way. We stayed in the rooms closest to the beach and everything was in walking distance. Our friends were on the far side rooms by the eco park and woke up every morning to feed the monkeys, it was amazing, even the 1 year old fed them out of her hand. Only saw a couple nite shows, Michael Jackson and Circus, both were excellent. If you remember MJ music from the 80's you will love it, the performer does an amazing job of dancing and portraying him. The Gaucho restarurant was by far the best, if you can get reservations, we also enjoyed the Mediterranean and Asian restaurants. The buffets were plentiful , but was quite a bit of the same, however you have so many other options, beach bagel bar and cupcake cafe and smoothies on the beach, our kids were happy. We ventured a couple times up to the family swimming pool for quiet afternoon swims with the 1 yr. old and it was great. Only complaint is the pillows were very hard, but the rooms were nice and clean each day. We did not spend a lot of time in them as it was so beautiful outside. Never had a hard time finding beach chairs, or places to sit by the pool. We did 2 excursions -one day at Xel Ha, if you go nowhere else you must go there, a day was not even long enough to enjoy it all, simply amazing. We also did Tulum & Cenote caves tour together-both interesting and short, we were back to our hotel by 2. We have been to Playa Del Carmen twice and Puerto Vallarta--by far we would return to Playa again and have no hestitation to stay at Sandos again. Just returned from a Christmas vacation to this resort. We loved everything about it! The staff was friendly, funny and helpful, (have to put in a good word for Ivy at the front desk, and Edwin at the swim up bar at the adults only pool!) It was clean and beautiful, and the food was truly wonderful, at both the buffets and the a la carte restaurants. It felt really "homey" there and we got comfortable very fast. There were unexpected nice little surprises like the resident iguanas, donkeys, monkeys and so on. The beach was beautiful, and having the lounge chairs sectioned (adults only, family, club members etc) was wonderful. It's also nice because there is only another resort on one side, so you can walk down the beach the other way for quite a way and it's a little wilder with more sea life to see if you like. We went for only 5 days - wish it had been 2 weeks! Great place, lovely people there everyone was so nice! We would definitely return. Loved the monkeys early in the morning. Armando on the entertainment committee made my kids week. They loved him and Pedro! "back for the fourth time !!))" from 7 untill 23 December we stayed for the fourth time at Sandos Playacar . We like it there because its an ideal resort for families with small children ,Our girls really love to be with Erika and her team from the kids club , Also nice for us during this time to have a nice adults only dinner in our favorite Restaurant Le Gourmet which is perfectly managed by Luis Renan and his team!!) On the Beach there are plenty of beds and our beachwaiters David E and Vannessa mex made sure that we got more than enough to drink during the day!!)) Also great to meet again with other guests from allover the world who are coming back every year again. special thanks to director Juan ""arango"" Oliveira and Daniela from the weddingservice for making also this holiday very special. And we hope that the trees that you let our girls plant will grown into big healthy trees!!) This year we stayed in a Royal Elite 1 bedroom hacinda on the groundfloor and its perfect for families , with a small swimmingpool and jacuzzi on the terras. further we liked everything new !!)) the mini golf, the playhall but also the Royal Elite avenue bar where they make great cocktails and also have a small cinema !!) We had a great holiday and hope to be able to go next year again!!)) Greetings from Rene , Megi , Elise and Emma from The Netherlands. We stayed at Sandos from Dec 9-14. We chose the Adult Only section since we were traveling without our teenagers and were looking for a very peaceful and quiet vacation. Saw two young kids around the adult only pool one morning but figured it was just a family touring around since they weren't there after a short time. You'll read on here about the long walk to the beach from this section of the resort and it's not an exaggeration .... But we personally loved it. With all the extra food you're eating, a little walk never hurt anyone. There are shuttle locations all along in case you want to hitch a ride. We were ground floor with two queen beds overlooking the pool. Room was always very well cleaned and towel animals left for us daily. Beach was beautiful! Offered full beach service which we loved and weren't offered at our last all inclusive stay (Riu). Staff clean the beach constantly as well since you can take food to the loungers. Waves can be high and a bit rough - red flag was flying most of the time. Staff are friendly and ready to make your stay a lot of fun. We ventured to Akumal to swim with the sea turtles and snorkel, to Cenote Azul, and 5th Ave for some shopping. There is lots to do in PDC and I would definitely go back and would stay at this resort again. Regular Rate $ 1797 . Today Only $499!